It felt like this month was approximately two minutes long, so I’m surprised to see that this stack is as big as it is! I read a surprisingly great trilogy this month, among some other gems, and I’m excited to keep cozying up with books this fall/winter. I bought a ton (too many) books this month and am now officially needing to go on a spending freeze… we’ll see how that goes. ANYWAY. MY REVIEW: This one is relatable and helpful, wise and gentle, convicting and calming, and a great tool for all (especially geared toward Christians) who don’t want to be controlled by their emotions. It’s a helpful companion for anyone on a journey toward personal growth, healing, and freedom (and echoed many things my counselor and I have been working on in my therapy sessions). I found it honest and not overbearing, purposeful but not overly preachy, and challenging but not condescending. MY RECOMMENDATION: If you read and enjoyed the original Boundaries book by Cloud and Townsend, this would be a great next read! MY REVIEW: As far as mysteries and thrillers go, this one isn’t especially thrilling. It seemed to take forever to actually have any real traction, and the conclusion wasn’t nearly as compelling or exciting enough to warrant such a long and drawn out plot without a lot of action or depth. It seemed to follow a pretty familiar script, and felt like it tried a little too hard to be mysterious without really having the meat to back it up. Not a favorite! MY REVIEW: This book was unlike anything I’ve ever read and I loved it for that reason! I loved her book The Lightkeepers and had high hopes for this one and was not at ALL disappointed. It’s intriguing and bizarre and mystifying and suspenseful and twisty and will make you think and keep you guessing... it’s truly a wild story and I thoroughly enjoyed reading it. This author has quickly become a favorite! Can’t wait to see what she does next. MY REVIEW: When a friend tells you about their most favorite book of all time, you read it! Devoured this one and already on book #2– it’s similar to Hunger Games (but I’d argue not as good...) but a little more mature. I’m more into this series than I thought I would be and I’m super curious how the other books play out and if I’ll end up liking these more than Hunger Games... who has read both series and has a favorite?! MY REVIEW: Book two of the Red Rising trilogy hooked me even more than the first (which I was super into, so that’s saying something!) EVEN reading on my Kindle (which I really hate, you guys). I’m such a fan of this series! Action, fantasy (sorta), romance, mystery, intensity, drama... Can’t wait to dive into book #3! This book found me RIGHT when I needed it. Oof, I loved this one. I probably underlined half the pages... just SO relevant to my season of counseling and unraveling and rebuilding. It’s beautifully written and poetic and powerful. Huge fan. Seeing him at the Evolving Faith conference only solidified that. MY REVIEW: This book would make a beautiful gift — it’s encouraging, uplifting, and joy-filled on every page. There are short writings that would be perfect for a daily devotional reading, and spaces for reflection and responses throughout. The themes build well over the book, from “Made to Be Happy” to “Holiness is Happiness” and “Healthy-Happy-Whole” and more. If you’ve read Alli’s work before, you’ll love this collection of more of her thoughts and heart, and if you haven’t read anything by her before, this is a great place to start! I loved her book Breaking Busy and think this goes hand-in-hand with its message, so I’d definitely suggest grabbing this one if you struggle with contentment and happiness in a chaotic and wild world! MY REVIEW: This book is short but stunning, brief and beautiful, poignant and purposeful and poetic. It brought tears to my eyes as it told a story of refugees... a must read for kids and adults and anyone in between. MY REVIEW: Finished this trilogy and LOVED it. Sometimes you just need to totally escape reality for a fantasy world and intergalactic battles and love stories and deception and intense drama and overthrowing hierarchies, right?! So glad I read these and can’t wait to dive into Iron Gold next and see where all my fave characters are ten years later! Add your links here if you blogged about books this month-- and be sure to browse around the other links and find new bookish friends! 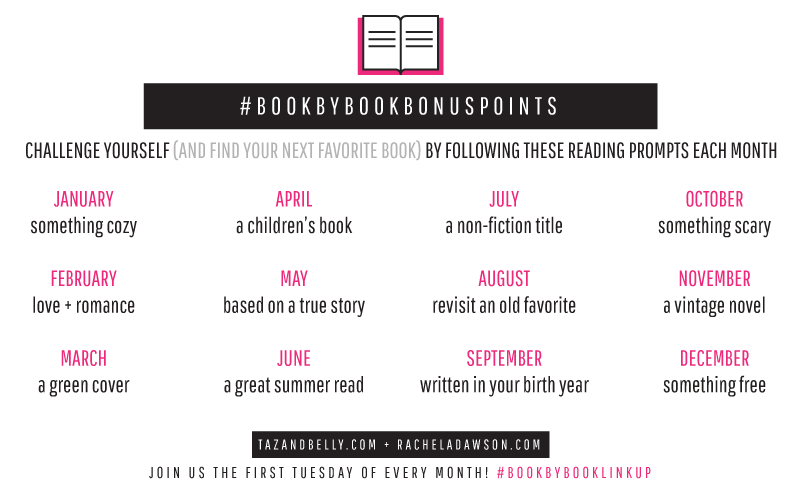 For bonus points, challenge yourself with one of the reading prompts below! Also, don’t miss Kristin’s post this month!